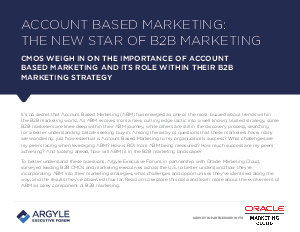 are wondering: just how essential is Account Based Marketing to my organization’s success? What challenges are my peers facing when leveraging ABM? How is ROI from ABM being measured? How much success are my peers achieving? And looking ahead, how will ABM fit in the B2B marketing landscape? ABM as a key component of B2B marketing.